VIP for Dictionary-IV is the complete graphical presentation layer of Thoroughbred's three-tier development architecture. 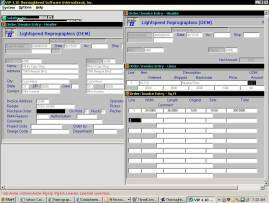 Any Thoroughbred based application using Dictionary-IV objects and VIP can operate using a Graphical User Interface (GUI) with existing program code. 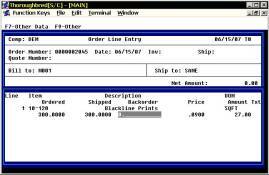 VIP uses Windows based PCs as user workstations, and is seamless to the application code and design. VIP is the complete graphical solution for Dictionary-IV based applications, and supports all Thoroughbred Environments. VIP includes the VIP Graphical User Interface, WorkStation Manager, TS ReportServer, and TbredComm, Thoroughbred's terminal emulator. VIP enables Dictionary-IV based applications to operate with either a Graphical User Interface presentation, or a character based presentation without changing the application code. The choice is up to the user. Power-users can operate all their applications with the same Windows GUI look and feel; and production users can operate character based data entry tasks with the speed and simplicity to which they are accustomed. Please click below to view an enlarged screen. VIP graphical objects include Menus, Screens, Views, Help, and System Messages. 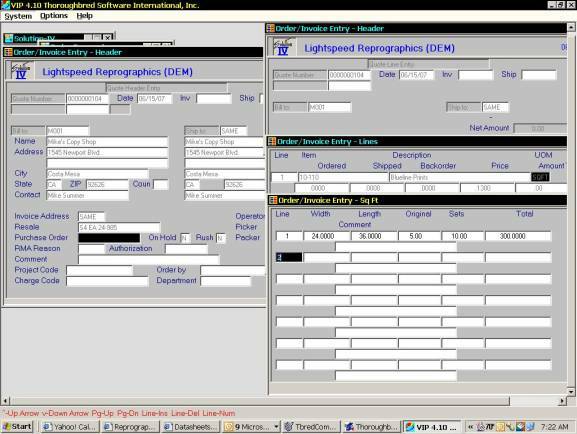 Dictionary-IV based applications can be presented in a complete graphical environment that uses standard Windows controls. Use your mouse to highlight a field or cell, click on a matrix menu for comprehensive drill-down information, select an icon or button for a report or to exit the application. TbredComm is Thoroughbred's terminal emulator for VIP. TbredComm provides both serial and TCP/IP communications capability for local, remote, and Internet processing. TbredComm provides a seamless communications interface with Thoroughbred applications in host based system architectures. VIP's WorkStation Manager provides access to the options that enable the customization and set-up of the VIP-based workstation. Options include: Character or GUI presentation, Local or Remote host, Start Menu program setup, Toolbar setup and position, Graphic Screen Designer, and Workstation presentation setup including default fonts, colors, Autologon set-up and Internet Server access information. 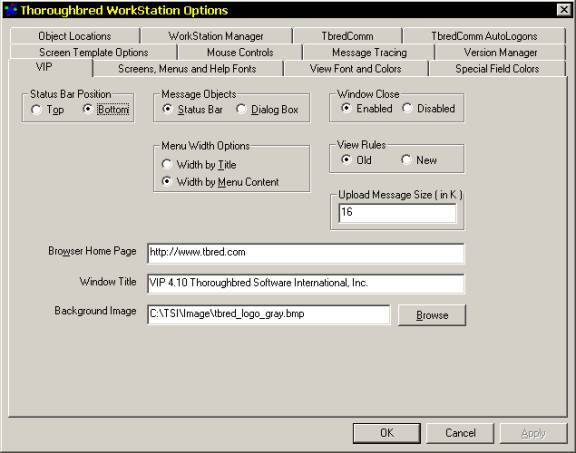 WorkStation Manager has a screen template designer that allows you to custom tailor your applications look and feel. TS ReportServer is included with VIP. Any Thoroughbred-based report can be set up to print to the TS ReportServer from a Local, Remote, or Internet host server. 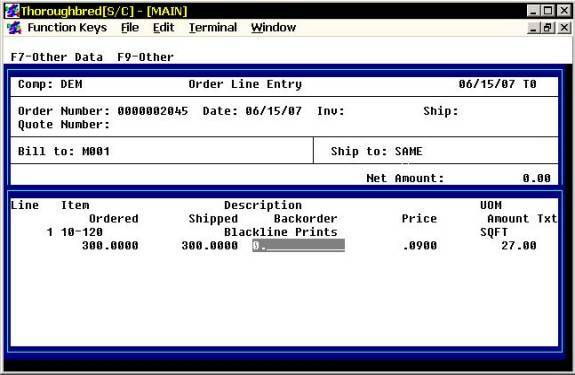 Reports can be displayed, saved, and printed to any printer defined in the Windows Print Manager. 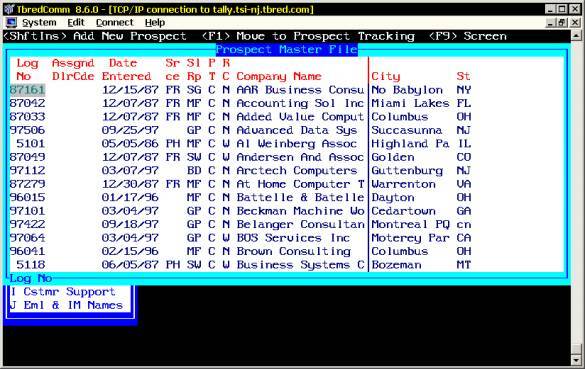 Features include FIND, COPY, font size and color selection, and save as a report (.rps) or text (.txt) file. TS ReportServer provides extensive features that make slave printing routines obsolete. VIP operates with any Dictionary-IV based application developed in Thoroughbred OPENworkshop® or Thoroughbred Basic Environment on any operating system supported by Thoroughbred. Many Thoroughbred-based vertical market applications are supported by VIP as well as Thoroughbred's Solution-IV Financial and Distribution software.